In the new Ms. Marvel debut, Kamala Khan is the first Muslim woman character to get a solo title comic series. MARVEL COMICS is releasing its new Ms. Marvel superhero on Wednesday — a Pakistani-American from Jersey City succeeding the original Ms. Marvel, a blonde, blue-eyed Bostonian introduced four decades ago. The 16-year-old Kamala Khan will be the first Muslim woman to get a solo title in a comic book series, which is a big deal in the superhero universe. The Ms. Marvel of the new millennium has come a long way from the original Carol Danvers character of the 1970s. Comic superheroes cater to a niche readership, but they also serve as signs of their times. The first Ms. Marvel was penned in the height of the 1970s women’s movement, of which Boston was one of the centers. Today, over a decade after the terrorist attacks on the twin towers and the repercussions for Muslims around the world, a new teenage superhero is born just across the Hudson from New York City. And she faces Mecca as she prays! The author of the new series, graphic novelist G. Willow Wilson, has disclosed in interviews she wanted to “give” the Pakistani-Americans their own superhero in Jersey City, the city she grew up in. Among groups that need a hero of their own, American Muslims seem most suitable. For a long time they had to deal with being labeled the “enemy” even when they, too, were being targeted as Americans. In Jersey City, where the two towers can no longer be seen on the Manhattan skyline, Muslims are constantly reminded that their religious identity could be seen as a security threat, regardless of how unfounded that perception is. 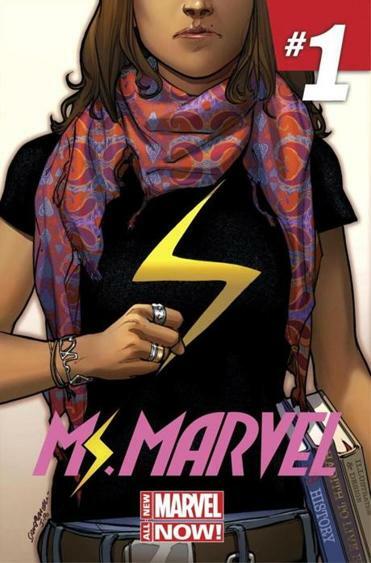 The new Ms. Marvel tackles both stereotypes of both oppressed Muslim women and terrorists. Many Muslim women chose not to wear a hijab, and Kamala’s character is one of them. She carries her US history book side by side with a book on prophet Mohammed’s sayings and another book on illustration and design. Her creators claim she was born “out of a desire to explore the Muslim-American diaspora from an authentic perspective.” They would know because they, too, have had to navigate their way of being Muslim and American. The idea of Kamala was inspired by Marvel editor Sana Amanat’s childhood as a Pakistani-American, she told The New York Times. And Wilson is a Muslim convert who once kept her religious identity a secret, a strategy many Muslims young and old employ in order to fit in a society where believing in Allah and the teaching of prophet Mohammed could be a liability. (Remember the uproar when rumors spread that President Obama might be Muslim?) With firsthand experiences of Muslims breathing into Kamala’s life, she might turn out to be more than a politically correct token Muslim in a predominantly Nordic superhero landscape. 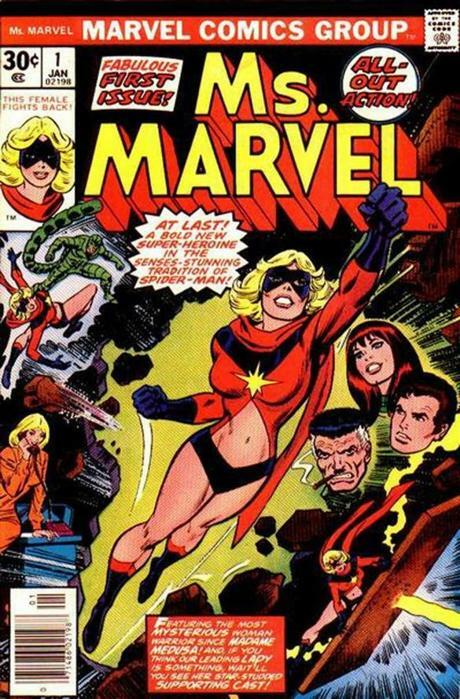 Carol Danvers debuted as Ms. Marvel in 1977. Kamala can shape-shift, shrink, and grow. She struggles to reconcile her identity as an American teenager and daughter of Muslim immigrants. Her powers then seem to match the ways in which she would have to navigate the cultural terrains of mainstream America and her Pakistani Muslim roots. She is not the first Muslim superhero. In 2002, Marvel Comics introduced Soraaya Qadir, a niqab-wearing former Afghan slave that goes by the moniker Dust. DC Comics also has Simon Baz, the new Green Lantern, who was falsely accused of being a terrorist, and Nightrunner, the French-Algerian Batman of France. In an interview with the BBC, Wilson said, “Superheroes represent the zeitgeist.” If the births of superheroes are influenced by the historical context in which they are created, then it’s no wonder we are experiencing a wave of Muslim superheroes in the last decade. Just a year after 9/11 we had a Muslim superhero that could turn into dust. Was it the sign of times, or something rooted in the American psyche? More Biblical perhaps, in that we all, victims and suicide bombers alike, turn into dust when we are blown to smithereens. Kamala arrives just as we have witnessed a real-life hero of Pakistani descent in 16-year-old Malala Yousafzai, who took a bullet from the Taliban, survived, and wrote a book about her experience. Is this the right time for the birth of a new superhero? Sure, she does not fit the stereotype. She is not a man. She is not sexed up. She is a Muslim. But she is a teenage girl who can throw a punch with a giant fist. Who would dare to mess with her? It will be cool to see how Kamala morphs into her multiple identities and grows as a superhero. Will she be able to live up to the mantel of the former Ms. Marvel whom she idolizes? Be as strong as her Afghan predecessor? Could she be America’s new superhero and save us all from prejudice? Time will tell. Let us watch her ride the zeitgeist and may she travel on the palm of Allah. Prodita Sabarini, an Indonesian journalist, is the 2013-1014 IWMF Elizabeth Neuffer fellow.